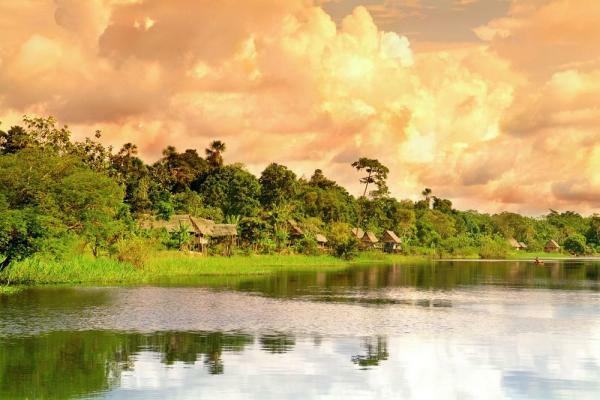 Join the Aria Amazon on this 8-day Amazon River Expedition Cruise and experience a luxurious and comprehensive journey among the Amazon River’s three powerful tributaries. Skiff the Yacapana Isles, meet gray and pink freshwater dolphins, visit Madgalena Village, and probe deep within the Nauta Caño within Pacaya-Samiria Reserve. These are just a few of the many highlights on this spectacular cruise! Visit Yacapana Islands, "Islands of the Iguana"
Meet at Iquitos International Airport then enjoy lunch together at a local restaurant or a box lunch en route, depending on the flight arrival time. The afternoon continues with an introduction to this historic city and the opportunity to meet an indigenous Amazon community. At 6:00pm board the Aria Amazon. Settle into your generously proportioned suite as you begin one of life’s greatest adventures. Following a routine safety drill and introduction to our naturalist guides, gather for innovative Amazonian cuisine created by your Executive Chef Pedro Miguel Schiaffino, whose restaurant, Malabar, is the one of Lima’s top ranked dining experiences. High Water (November - May): Board your comfortable skiffs then set sail from the Amazon River to the Yarapa River. 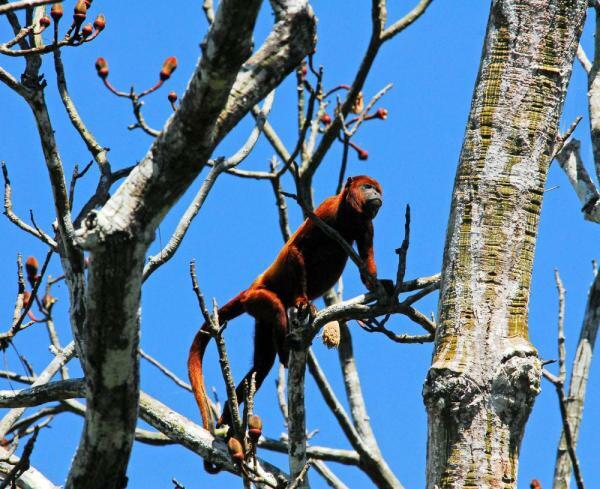 Keep your binoculars ready to spot tropical songbirds, black-collared hawks, and sloths. Go fishing for Amazonia’s notoriously ferocious piranhas while naturalist guides share stories of Lake Moringo. As the sun sets, head off on an evening’s wildlife excursion with extraordinary stargazing on the black waters of Nauta Caño. Low Water (June - October): Commence today’s adventures near the main entrance of Pacaya Samiria National Reserve, cruising along Yanayacu Pucate in the comfort of state-of-the-art skiffs. Kayak, canoe, and swim in these unspoiled black waters, keeping eyes peeled for the Amazon’s legendary pink dolphins. In the afternoon, visit a remote village along the Marañon River to learn about traditional customs. Focus hi-tech telescope on the night sky to identify the planets and constellations. High Water (November - May): Rise with the sun to explore a ‘lost river’ along the Marañon River. After breakfast, take a jungle walk across suspended bridges deep into the high Amazon rainforest. 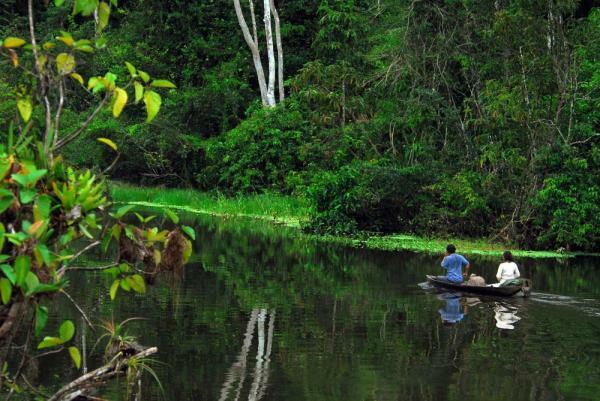 Later, swim, canoe, or kayak in Yanayacu-Pucate River as you look for legendary pink river dolphins. Focus a hi-tech telescope on the night sky to identify the planets and constellations. Low Water (June - October): Set off by skiffs for an excursion along the Samiria River with optional fishing. Listen carefully to an after lunch flora and fauna lecture, then venture out for a singularly thrilling jungle walk across suspended bridges deep into the high Amazon rainforest. On your return in the evening, enjoy the jungle symphony and extraordinary stargazing on local boats along the “Enchanted Lake”. High Water (November - May): This morning, visit the local fresh market with your guides who can identify the day’s catch by the fishermen of Amazonia and the region’s exotic fruits. 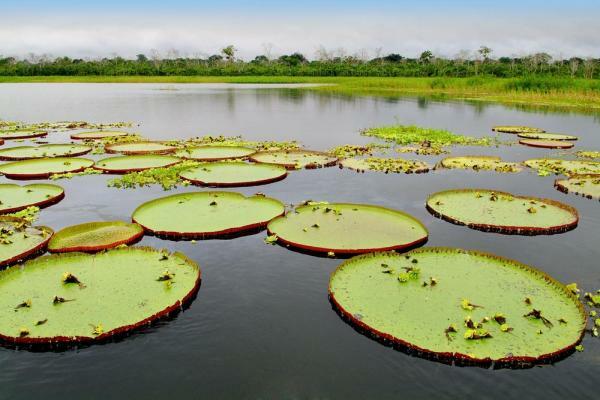 In the afternoon, witness one of the great spectacles of the Southern Hemisphere, the birthplace of the Amazon River. Tonight meet the new passengers who have signed on for the four-night trip, as you start your journey together along the Marañon River. Low Water (June - October): This morning, visit the local fresh market with your guides who can identify the day’s catch by the fishermen of Amazonia and the region’s exotic fruits. In the afternoon, together witness one of the great spectacles of the Southern Hemisphere, the birthplace of the Amazon River. Tonight meet the new passengers who have signed on for the four-night trip, as you start your journey together along the Marañon River. High Water (November - May): By skiff, explore the black waters of the Yanallpa River, disembarking to walk deep into the Amazonian rain forest. Later, board the skiffs again to cruise along the El Dorado River for a dusk excursion in search of exotic nocturnal wildlife. Low Water (June - October): Boarding your skiffs, start the day like Amazon River dwellers, cruising along the Ucayali River. As these farmers and fishermen go about their business, search for pink river dolphins in these pristine waters. Later in the day, return to the skiffs to ride along the black waters of the Pacaya River at dusk, searching for the mysterious wildlife that come out after dark. High Water (November - May): The rewards of your early start today are plentiful, including a breakfast picnic accompanied by a jungle symphony and fishing along the black waters of the Pacaya River. After lunch, venture out by skiffs on the Ucayali River alongside the banana boats transporting their jungle products to the port of Requena, keeping an eye out for pink river dolphins. Low Water (June - October): The rewards of your early start today are plentiful, including a breakfast picnic accompanied by a jungle symphony and fishing along the black waters of the Pacaya River. After lunch, venture out by skiffs on the Ucayali River alongside the banana boats transporting their jungle products to the port of Requena, keeping an eye out for pink river dolphins. High Water (November - May): Choose to go jungle walking, canoeing, kayaking, or swimming on the black water Yarapa or Clavero River in the morning. 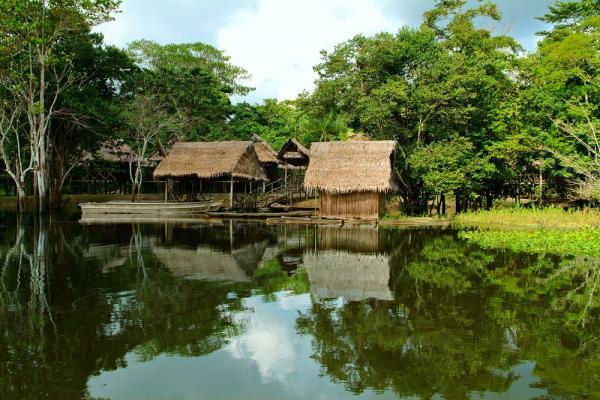 Visit a remote Amazonia village in the afternoon. This evening before dinner, gather to be introduced to some of the crewmembers whom you may not have met, working "behind the scenes" to ensure your countless exceptional experiences aboard the Aria Amazon. Low Water (June - October): Choose to go jungle walking, canoeing, kayaking, or swimming on the black water Yarapa or Clavero River in the morning. Come afternoon, take a short jungle walk in the San Jose flooded forest and see the unforgettable giant water lilies. This evening before dinner, gather to be introduced to some of the crewmembers whom you may not have met, working "behind the scenes" to ensure your countless exceptional experiences aboard the ship. High Water (November - May): At the Bellavista Nanay morning market along the Nanay River, sample exotic snacks from the Peruvian Amazon like ‘Suri’, Amazon caterpillars that are considered especially appetizing. Return to the Aria for breakfast and to pack up. Before saying goodbye, make one last truly memorable stop at the Manatee Rescue Center, a very special kind of animal orphanage for Amazonian manatees. Also visit San Juan craft market en route to the airport. Lunch or box lunch is provided, depending on the exact departure flight time, which may vary. Other local activities may be included as well, according to the flight schedule. Low Water (June - October): Visit the town of Nauta, founded in 1930. Today, villagers from around Amazonia gather here to sell the products they harvest in their rural communities. Together walk around Nauta to gain insights into the daily life of these remote people. Return to the ship for breakfast and to pack up. Before saying goodbye, visit the Manatee Rescue Center, a kind of animal orphanage for Amazonian manatees to rescue, rehabilitate, and release them back into the wild. Also visit San Juan craft market en route to the airport. Lunch or box lunch is provided, depending on the exact departure flight time, which may vary. Other local activities may be included as well, according to the flight schedule. Averaging 250 sq. ft. Eight suites on the first deck featuring two twin beds convertible into a California King bed, floor to ceiling panoramic windows, air conditioning, en suite sitting area, internal communications system, bathroom with shower, toilet, sink, cabinet, hairdryer, hot water around the clock and a basket of toiletries. Averaging 250 sq. ft. Eight suites on the second deck featuring two twin beds convertible into a California King bed, floor to ceiling panoramic windows, air conditioning, en suite sitting area, internal communications system, bathroom with shower, toilet, sink, cabinet, hairdryer, hot water around the clock and a basket of toiletries. Single Supplement: 25% in addition to the double rate as posted. Third Person Rates: 20% discount for a third passenger sleeping on the sofa bed. Children Discounts: Children under age 12 will receive a 20% discount. A child sleeping on the sofa bed as a third passenger in the room will pay $500 per night. *Join Jean-Michel Cousteau on the February 9 and October 5, 2018 special-edition departures. 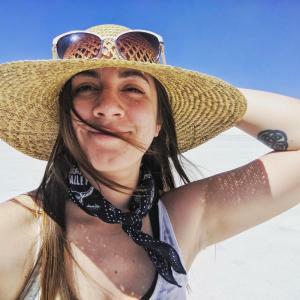 Travel with a world-renewed explorer, filmmaker, educator, and champion of ocean conservation. Enjoy unique opportunities for interaction and inspiration. A limited number of spaces are available. The above itinerary is intended as a guide only, and is subject to change due to weather, water levels, and the captain's discretion. Final payment is due 101 days prior to departure by Bank transfer, check or credit card. All final payments by credit card may be subject to a surcharge and maximum of $20,000 charge.